Description of "What on earth is a Mainframe? (eBook)"
To many people who are thrown to work at a mainframe computer on their first job, they feel lost. The hardware is a complete mystery. Programmers work on green screens. Mainframe people seem to speak a completely different language and that doesn't make life easy. What's more, the books and manuals are incredibly hard to comprehend. 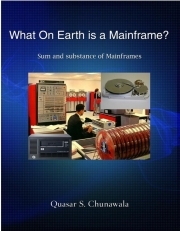 Reviews of "What on earth is a Mainframe? (eBook)"